That pianist Kenny Barron is a lover of Brazilian music is not news. He came up in the ’60s-and with Dizzy Gillespie, for Pete’s sake. 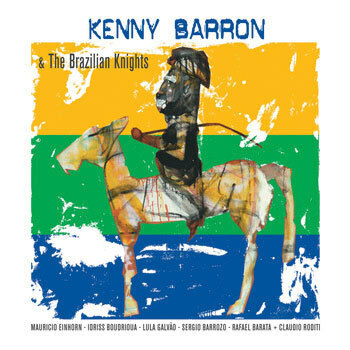 Brazilian Knights, featuring Barron and a Brazilian sextet at a 2012 session in Rio das Ostras, is his third full-length recording of that music, a typically masterful effort that shines a light on the pianist’s unimpeachable rhythmic touch. Indeed, from the first moment of his improv on the opening “Rapaz De Bem,” Barron evinces a complete understanding of Brazilian grooves. All he needs is a seven-note motif that recurs throughout, in various rhythmic permutations. That knowledge runs deep: He uses his solo to practically recompose Baden Powell’s “Só Por Amor” (with the empathetic help of bassist Sergio Barrozo and drummer Rafael Barata), and buries himself so thoroughly in the rhythm that he appears to be the one complementing guitarist Lula Galvão on “Triste,” when in fact it’s the other way around. That also speaks to Galvão’s gifts: He could easily share top billing with Barron, with the delicate but richly resonant lines of his acoustic guitar. The quiet joy he brings to “Curta Metragem” brings even more life to the sprightly tune, and the intricate details of his work on “Tristeza de Nós Dois” make it the album’s best tune-not to mention his sensitive but surefooted comping throughout. The album’s two other soloists, saxophonist Idriss Boudrioua and harmonica player Maurício Einhorn, also do fine work; Einhorn’s thickly laid cascades on “Chorinho Carioca” are particularly superb. (Claudio Roditi makes a regrettably brief appearance, playing both trumpet and flugelhorn on “Só Por Amor.”) Brazilian Knights is a high-quality recording from a musician whose high quality is inevitable.